On behalf of Iraq and Afghanistan Veterans of America (IAVA) and our nearly 400,000 members and supporters, we would like to extend our gratitude for the opportunity to share our views and recommendations regarding these important pieces of legislation. Disabled veteran unemployment has consistently been much higher than that of the greater veteran population, hovering at nearly 20%. Disabled veterans must be given the support necessary to overcome barriers to employment and achieve economic empowerment. VRE exists for that very purpose and yet, many disabled veterans don’t know it exists, do not participate, or too often find the services it offers to be inadequate in securing a rewarding career. This legislation would improve the VRE program by creating an action plan designed to identify why the program is underutilized and put steps in place to improve its output. The recommendations that would stem from its enactment would include an analysis and plan to increase disabled veteran participation. Additionally, a national staff training program would be installed for the counselors charged with implementing the program to ensure the variety of challenges their clients face are understood holistically. Without a fundamental understanding of the conditions a veteran is facing, a counselor will not be positioned to identify how to help the veteran secure a job and begin a rewarding career. This legislation would improve a program that has been too often regarded as mediocre due to organizational factors as it relates to the veteran-counselor relationship. Veterans make use of services to assist them in transition for the sole purpose of improving their economic outcomes. Simply put, they want to succeed and secure a brighter financial tomorrow. This legislation would create a comprehensive longitudinal study to determine to what extent the job services veterans use aide them in securing careers. Identifying which services veterans used, the amount of time they spent on active duty, whether or not they are collecting unemployment benefits, whether or not they secure work, and whether or not they stay with those jobs are all key pieces of information, the collection of which this bill would require. The report and data developed through this legislation is needed to ensure these programs are bringing back a return on investment for the veterans using them. Over one year after the Phoenix wait-list scandal shook the veterans community nationwide, the Department did not fire one employee for wrong-doing related to that incident. IAVA strongly supported the increased accountability provision of the Veterans Access, Choice, and Accountability Act (VACAA) last year which gave the VA Secretary increased authority to remove SES employees who do not serve our veterans to the standards they earned. We now support–in that same spirit–expanding this removal authority to the greater VA workforce, notwithstanding whistleblowers, and publicly applaud Chairman Miller for refusing to give the Secretary any less authority than is fully necessary to get the Department back on the right track. We have heard– and agree with–DepSec Gibson’s testimony a few weeks back, which indicated it is currently too hard to hire and fire employees. This legislation would shorten the appeal period for VA employees engaged in misconduct or poor performance so in those rare cases of wrongdoing, the Secretary is empowered to take corrective action more briskly. The process of personnel action should not languish in a sea of bureaucracy as it has been. I also want to make clear that the vast majority of the VA workforce does a fantastic job of serving our veterans every day and too often does not receive enough praise. The sooner we get real reforms to stick, the sooner the headlines of misconduct will fade. This legislation would allow a veteran transitioning away from active duty to receive additional education, career, technical, or entrepreneurial training. This would empower service members and give them an early advantage in transitioning back to the workforce. This legislation would create a fourth administration at VA that would align all veterans’ education, transition, and job placement programs under one agency entitled the Veterans Economic Opportunity and Transition Administration. This new administration would be led by the Under Secretary for Economic Opportunity. Veterans we speak to have long reported overlapping services have clouded options rather than clarified them. GAO reports and feedback from our annual member survey have indicated the performance of LVERs and DVOPS under DoL VETS has been stagnant at best and not shown the improvement needed to help veterans begin careers. Ineffective oversight and the incongruent placement of this service within a myriad of other programs over at DoL has not proven to be a positive fit. IAVA has previously likened this to having a Member of the U.S. House of Representatives posted in an office in the U.S. Senate, while still being responsible for legislative outcomes in the House–it doesn’t make much sense. The time to change the status quo and put veterans first is now. This legislation would provide Secretary McDonald the needed flexibility to prioritize the provision of services under VRE. Disability ratings, the degree to which veterans face employment barriers, and other factors can assist in executing the program in a more equitable manner. Additionally, IT upgrades under this legislation would streamline and improve the manner in which claims are processed within the program. VRE is a program specifically purposed to support veterans with disabilities. By making sure appropriate modifications are made, the likelihood of veterans being employed increases, which is paramount for those using the program. This legislation would restrict the VA from approving courses, for the purpose of distributing GI Bill funds, to programs that are unaccredited or do not meet the licensure or certification requirements of the state in which the program is provided. We have already seen many examples of for-profit colleges, with much higher tuition costs than most public universities, providing education programs to veterans that often leave them ill-prepared to be competitive in today’s workforce, which then leads to unemployment. There still continues to be debate on these topics both within that sector and in Congress. However, this is a piece of legislation everyone should support because after completing these programs, the veteran is still unfit for employment. These programs are not recognized by the accreditation boards and too often the veteran was unaware when they enrolled because of poor counseling from the school’s staff– often sales professionals incentivized to sign them up. This legislation would provide obvious quality control and encourage veterans to pursue programs that will provide value long-term. 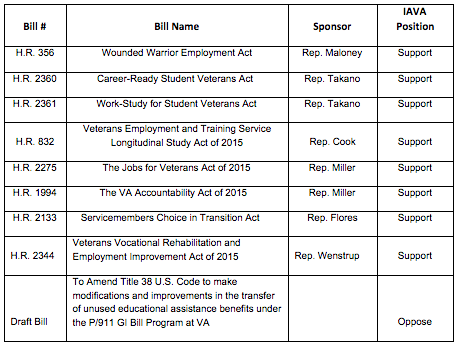 This legislation would assist student veterans by extending the work-study program until 2020. This legislation would increase the years of service obligation required of a service member in order to maintain the option of transferring their benefit to a dependent. We testified this year in both congressional hearings and have spoken at informal roundtable discussions on this topic. Again, IAVA is strongly opposed to this change without a more substantive discussion that involves our members’ support. The GI Bill and the benefits associated with it were a tough fight on the Hill and diminishing the value of veterans benefits must involve stakeholder support before a major change is made. Thank you for your time and attention. I am happy to answer any questions you may have. As Legislative Associate, Christopher maintains Congressional relationships and supports advocacy programs and routinely comments on policy matters in the national media. He provides editorial support for IAVA priorities in print regularly. Chris spent 6 years in the U.S. Army Reserves as a military police NCO and served a tour of duty in 2003 during Operation Iraqi Freedom detaining Enemy Prisoners of War (EPWs), and performing base security and customs during the Iraq war. 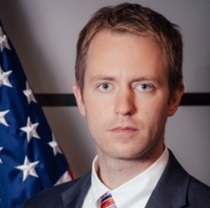 Neither Mr. Neiweem, nor the organization he represents, Iraq and Afghanistan Veterans of America, has received federal grants or contract funds relevant to the subject matter of this testimony during the current or past two fiscal years.